This CV template uses Century Gothic, Calibri and Open Sans Regular - make sure you download them before you open up the template. Journey free CV template in Word format	Overall rating:	4.2	out of 5 based on 9	reviews. There is plenty to customise with this lovely fresh one page CV template - first of all, the background can be changed to suit your own journey or replaced simply with a soft hue. Secondly, you can add in a photo or delete the box if you'd prefer not to. There are icons for your information and sliding bars so you can demonstrate your skill level (each of these is easily adjustable). 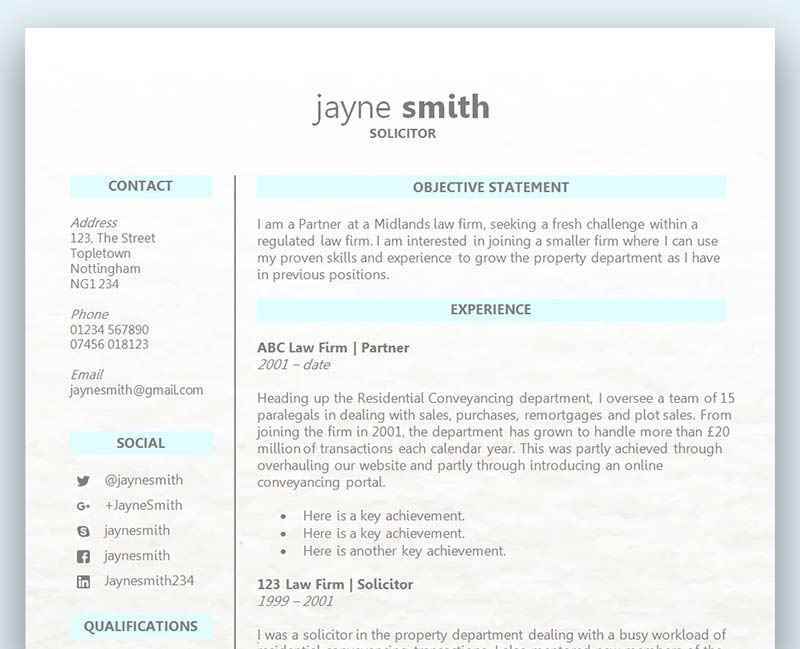 This is a lovely one page CV with scope to really make it your own - showcase your creativity with our lovely free Journey template. Writing a great CV is going to give you the best possible chance of gaining an interview. You should never underestimate how much work and focus should go into the creation of the Curriculum Vitae. Always make sure you give yourself enough time to write a great CV, and never leave yourself in the position of having to rush one through to an employer. Most people keep a copy of their CV and keep updating it over the years every time they change jobs. This is a great idea, and you should always keep an accurate record or an internal move, promotion or change of company. However, you should look to do just more than a simple edit each time, and if you are applying for a new job you should tailor it to the company and the role. A generic CV that you keep over the years is going to look old, tired and outdated very quickly, and with more and more CV templates popping up on the internet to choose from, creativity is at an all time high when it comes to the CV. With each application you should study the job advert closely and tailor your CV to the requirements. That way you ensure your CV stays fresh and up to date, and ensures your application stays focused and on point. Spelling errors are still the biggest issue the hiring manager sees on a regular basis. You can guarantee that with every ten CVs passed to the manager that there is at least one spelling or grammatical error to be found. It is a huge irritation to the reader, and for obvious reasons. It shows a lack of care and effort, and could leave the manager thinking that you will show the same if you got the job. The best way to ensure your CV is error free is to ask a friend if they can check it for you. Ideally you want to find someone who is or has been a manager and has extensive experience reading CVs, interviewing and hiring.